If you can wrap your brain around what developer Villa Gorilla calls an “open-world Metroidvania pinball adventure,” and you don’t mind playing as a spry dung beetle, you’re in for a unique and wholly satisfying treat. 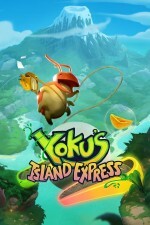 Yoku’s Island Express turns the simple action of hitting a ball with a flipper into a joyous journey through a world filled with quests and secrets galore. This odd mash-up of genres works better than you might think. The player assumes the role of Yoku, who happens to be tethered to a ball of petrified feces. As disgusting as this object may sound, Yoku uses it as a means of locomotion. He’s tied to it via a short rope, and he mostly has to hold on for dear life. Yoku has just taken on the role of Mokumana Island’s postman, and he needs to cover ground quickly if he wants to deliver mail before the island god brings torrential rain and quakes. Yoku can freely push the ball to the left or right, but can’t jump or do much of anything other than blow on a whistle. When stacked up against the Samuses and Alucards of games of this ilk, he’s easily the weakest and most useless of the lot. Thankfully, the world itself is filled with colored flippers that can propel Yoku and his ball wherever he needs to go. The island design is so good that a flipper is always where you want it to be, yet the placement doesn’t always tip off a clear path to where you need to go. You know the flipper propels you upward, but it may take you to a ramp that swirls into an underground cavern, or it may launch you into a bumper that sends you off in an unintended direction. I frequently looked at the map trying to make heads or tails of the puzzle-like world design. Figuring out which flipper or path is the right one is part of the fun; even when you have a path charted, timing sometimes comes into play, as some locations can only be reached from a precise hit on the flipper. All of the pinball basics are firmly established in this adventure, outside of tilting. The drain between the two flippers is often occupied by thorny briar, which hurts Yoku and makes him drop some fruit (the game’s form of currency). Collecting fruit isn’t a hassle, but this act encourages thorough exploration, as you’ll need to cash it in to open up new routes, quests, and handy items. Yoku never needs to score points or keep a ball alive for extended periods of time. That said, some areas on the island are essentially pinball tables. They are closed-off spaces featuring ramps, bumpers, and switches. These tables are designed well, delivering frantic flipper action and skillful shooting, all while maintaining the feeling that they are a part of an adventure. 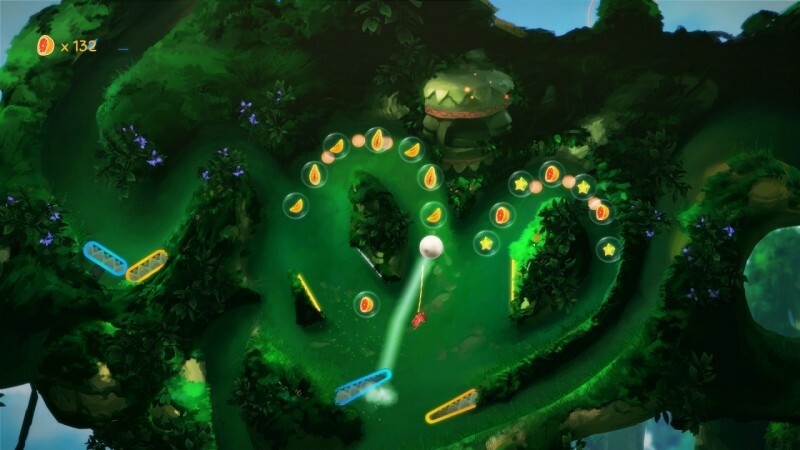 The nerve-racking concept of multiball is used in a clever way in Yoku’s Island Express, but I don’t want to spoil exactly how, as it is tied to the larger story and one of its better quests. You find quests littered across the sprawling map, many leading you to new locations or back to previous ones (with new powers that allow you to access a different area). Powers include the ability to swim by latching a fish onto the dung ball, and a grapple-like swing using the mouth of a hungry plant. These skills add variety to the ball-smacking action, although the timing of the grapple is tricky, often forcing me to retry a sequence over and over again. Secrets and collectibles emerge as Yoku uncovers more of the map – which is hidden behind fog of war until he reaches new areas. Some of the world’s biggest elements are tucked off to the side, and can only be unearthed if every little area is explored. To reach these spaces, you need to keep your eyes peeled and search the beautifully detailed areas for secret passages or points that a ball can be launched in a specific direction. Some areas lead to boss encounters. These giant or agile beasts don’t like getting smacked with a ball, and may have some ways to create obstacles that prevent you from lining up shots. 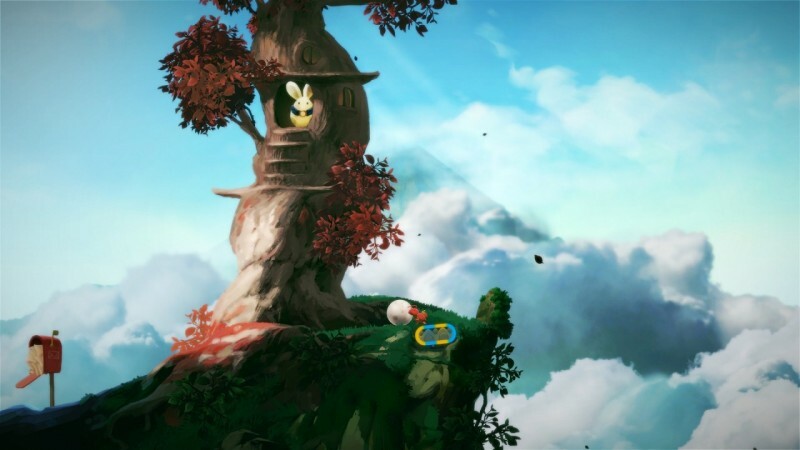 These battles get the blood pumping, but never once do you fear you will fail in any way, as Yoku’s Island Express doesn’t have any fail states. At worst, you lose fruit and have to obtain more, or have to fire off shot after shot to hit your mark. The most stress comes from figuring out how to navigate the land without getting lost. Exploring the island is a little annoying in the opening moments, but becomes hassle free once a slick fast-travel system is activated. When the credits rolled, I had only unearthed 57 percent of the content, and was eager to jump back in to unlock the big secrets, which are teased nicely at specific points during play. The critical path in Yoku’s Island Express can be completed quickly, and there could definitely be more meat on that bone, but it’s a journey I urge every pinball and Metroidvania fanatic to play. Villa Gorilla doesn’t just introduce a new concept to gaming – it has full ownership of it, and shows us just how fun it can be. Pinball meets Metroidvania in a beautifully crafted adventure unlike anything else out there.